Nice hat. There’d be room for a pony tail to hang free if you loosen the ties. And if you loosen the ties all the way, there’s room for a neck. Hat plus cowl equals Howl. 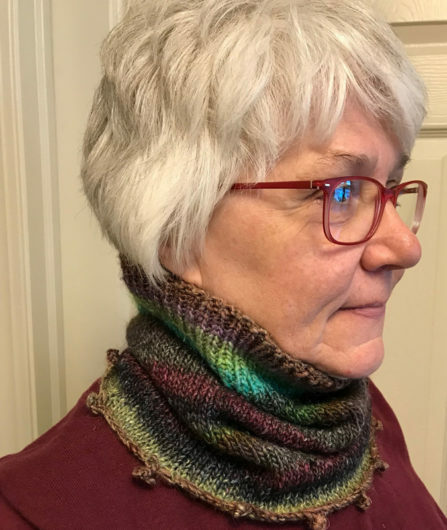 Howl, by Kimmy Zalec, is a free Ravlery download designed for exactly the yarn I used: Noro Silk Garden. Silk Garden is 45% mohair, 45% silk, 10% wool and charts out as an Aran weight. Two 50-gram skeins will do the trick and leave you with about 16 grams to spare. Very cozy and very fun to knit. My Howl was gifted almost as soon as it left my needles. Here’s another look. 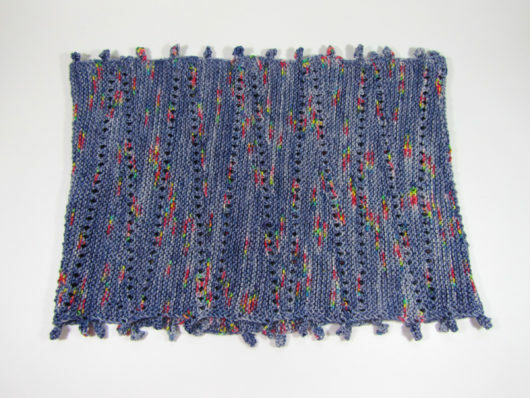 It needed blocking to make that unusual picot bind-off behave and to tame its curling. I’m planning to knit another of these soon. 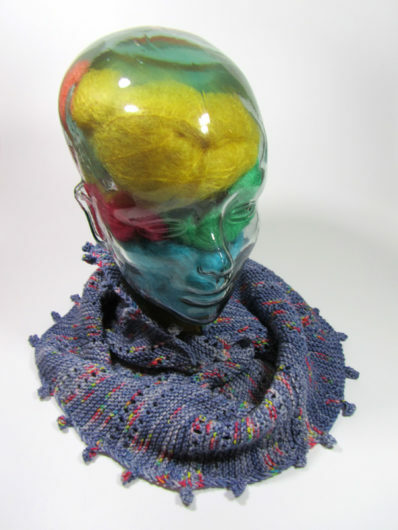 Glass head is wearing Bobble Cowl by Joji Locatelli. 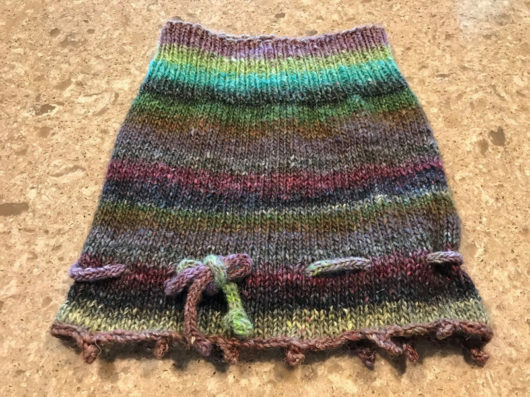 It’s an easy, rhythmic knit, filled with every knitter’s first stitch (garter), but with interesting details. The pattern is 48 rows, to be repeated a dozen times. I had to count rows. And a few times I lost count. But fortunately it’s easy to figure out where you are. I decided not to block the cowl. I’m satisfied with the yarn-overs not opened up wide. I didn’t want to kill the cushiness of the garter stitch. I prefer a closer fitting cowl rather than one that drapes long. Bobble cowl is knit flat. I used a crochet provisional cast-on and then grafted the beginning to the end. A three-needle bind off would have worked well too. This is a new yarn to me. 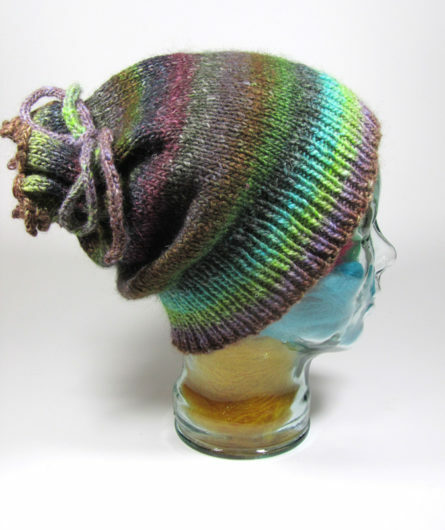 I’m a fan: Dark Side of the Moon by Alexandra’s Crafts in the Twilight colorway. It’s 80% Merino and 20% Tussah Silk. 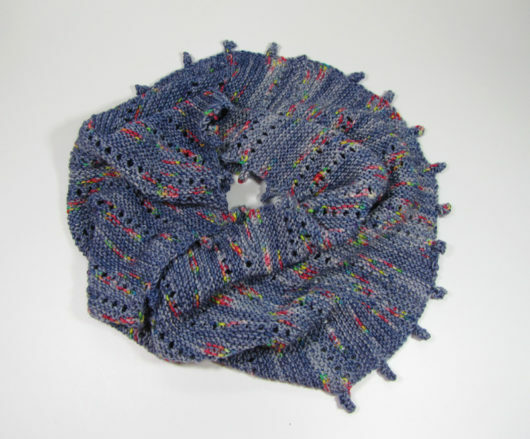 Bobble Cowl is a garter-stitch yarn-eater. So this cowl took nearly every yard of the 434 yard skein.